I have never been there, but family members are always bragging about a cookie they would get at the Harrison Bakery in Syracuse, New York. They called it the Half Moon Cookie. I just had to find out about this little delicacy so I set out to find the recipe. Wow! Not only did I find many variations of this cookie, I found multiple names for it. Seems like this is a popular little cookie. 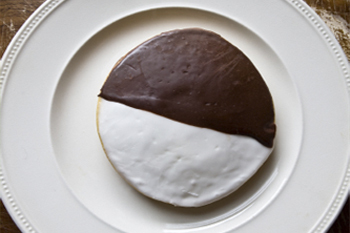 Half Moon Cookies Black and White Cookies Amerikaners Each recipe differs a bit too. There are chocolate cookies and vanilla cookies. Some come with a simple confectioner’s frosting and some with butter cream frosting. Several were a thinner, crispier cookie, while various ones were a thick chewy type cookie. I decided to try the following recipe, and I was very happy with the results. Cream the sugar, brown sugar and the shortening. Add egg to the mix until combined. In a separate bowl, stir together flour, cocoa, salt, baking soda and baking powder until cocoa is distributed throughout. Add this to the wet ingredients and alternate with milk a little at a time, mixing well, until thoroughly combined. This mixture will resemble a thick cake batter. Scoop and drop onto lined cookie sheet. Bake for 10 to 12 minutes and remove from oven. Before placing on a wire rack to cool, let the cookies sit on the pan for a minute or two. Combine all ingredients except the cocoa. Beat until smooth. Divide this mixture in half. Add the melted chocolate to half the mixture and stir well. Keeping the frosting slightly warmer than room temperature allows for easier spreading. Thank you for the recipe, can’t wait to try this and to check out all your recipes!